There was a nice piece on me in Italian magazine Fashion last week. These interviews are usually fairly repetitive, but I did have a chance in this one to mention my love of Charlie Mingus, and how proud I am that my grandfather reads everything I ever write. Nice personal touches. 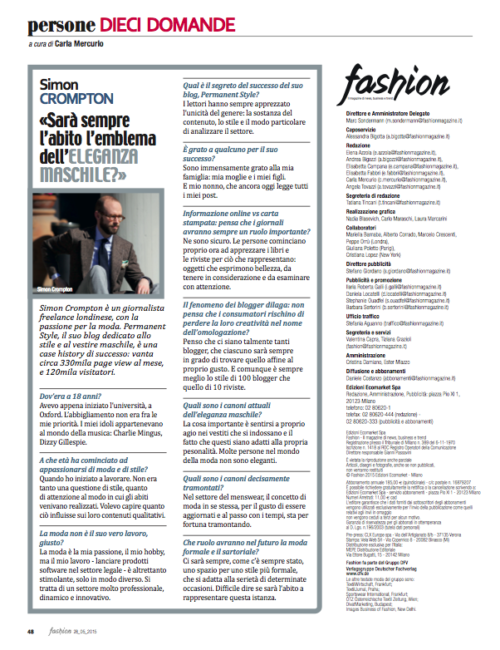 You can follow the discussion on Interview in Fashion (the magazine) by entering your email address in the box below. You will then receive an email every time a new comment is added. These will also contain a link to a page where you can stop the alerts, and remove all of your related data from the site. the Italian version seems to be accurate and with proper meaning.